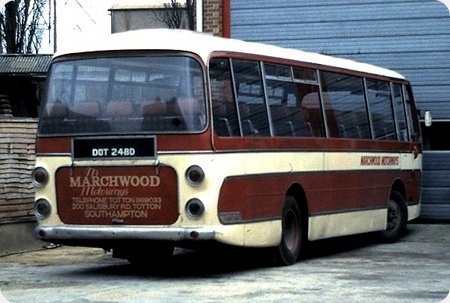 DOT 248D is a Bedford VAM, bought new in 1966 by Marchwood Motorways of Totton, near Southampton (not TOTON, the great railway marshalling yard and depot in the Midlands!). The bodywork is by Plaxton. Like other members of the fleet bought new, she would have been on private hire and tours duties, before being relegated to staff bus duties at Fawley refinery. We see her in the depot yard on 9 April 1983. She isn’t a survivor. Marchwood also had a sizeable fleet in Pembrokeshire until about September 1981. These vehicles were mostly used in connection with the refineries at Milford Haven.When Marchwood decided to withdraw from the area some of the fleet stayed with Pembs operators. Five found a new home with Richards Brothers, Cardigan; they were all Bedford YRQs as follows FOU 217/8K (Viceroys) HPB 674N and TPX 332P "Dominant buses) and JDE 252L, a Dominant coach. Thanks for that, Les. I have but a vague recollection that the Pembrokeshire operation was, legally at least, a separate company operated as a subsidiary, but I’m probably wrong. The FOU 217/7K Bedford YRQ’s were registered in Southampton. At the risk of being accused of nit-picking, Chris, OU was a Hampshire registration, not a Southampton one. Southampton used CR, OW and TR (until the reorganisation of local government in 1974, when DVLA was established and letters like AX, GM or JM moved from one end of the country to another). You’re right, of course, Pete; a senior moment, I’m afraid! The last Bristol MW’s entered service in May 1967, and the first LH’s in June 1968. In the interim, Western National placed in service a batch of twelve Bedford VAM 5 with Eastern Coachworks bus bodywork. These were numbered 701-712 (KDV 131 -142F). The body design was clearly based on the standard design which had been produced in large numbers for the Bristol MW model, but with a more modern front end grafted onto it. The VAM 5 model had the small Bedford 330 cu in engine and a four speed gearbox. 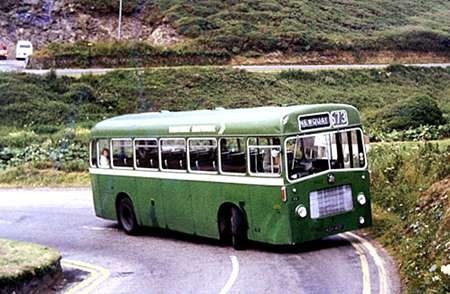 The batch led a full service life of at least twelve years; Latterly the last six of the batch were allocated to Newquay Depot, and could regularly be found working the scenic and hilly route 573 from Newquay to St. Columb Minor, which followed the coast for a few miles before turning inland. Here we see one of the batch negotiating a hairpin bend just west of Watergate bay. West Yorkshire also had four Bedford VAM with this style of ECW body, but the West Yorkshire examples were type VAM 14, with the Leyland 400 engine and a five speed gearbox. The West Yorkshire batch had a very short operational life. I believe that Eastern Counties also had some of these interesting vehicles. 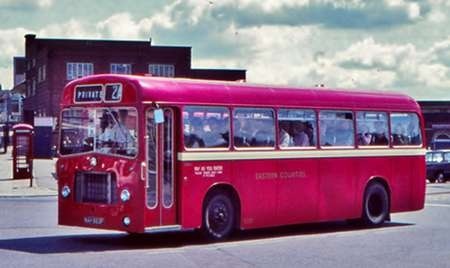 Eastern Counties did have some of these ECW bodied Bedfords one was sold to Primrose Valley of Hunmanby. I rode on it from Filey to Reighton Gap and I have to say never had I been on a more vibration prone vehicle. Although having now had a ride on a preserved Bristol SC! I always considered these to be fascinating and businesslike vehicles, combining the classic "no nonsense" ECW lines with a most worthy lightweight chassis. I’ve always had a very soft spot for Bedford "no nonsense" honest and well performing vehicles, and if any vibration was felt look on the bright side Chris – therapeutic vibro massage included free !! I remember encountering these beasts at Dartmouth in the early ’70s. With the benefit of hindsight (as well as driving later examples) I would hazard the opinion that the zenith of Bedford’s existence was with their petrol models. With due deference to Chris, I would say that Bedford diesels were a poor substitute and my operator friend concurs that the VAM5s he operated with Eastern Scottish were a nightmare and grossly underpowered. Likewise, Ribble got rid of its small number of VAM5s after an indecently short time. While the 466 and 500 diesels were a great improvement, there is a general consensus that the VAL14 and VAM14 (Leyland O400) were far better than the VAL70 and VAM70 (Bedford 466). Which makes the short operational lives of West Yorkshire’s VAM14s all the more strange. I don’t remember these when growing up in Taunton but I’ve asked for more information from Colin Billington who says "The early ones (700-703) were allocated to Plymouth often passing through Kingsbridge on the 93 route. Don has the numbering wrong, They were 700-711 (KDV 130-141F) not 701-12. 712 was a LH. Noisy things with the engine next to the driver"
Don is correct. ECOC had four VAMs with ECW bodies: 2 X Bedford engines and 2 X Leyland engines! SB663 (NAH 663F), with Leyland engine, is seen leaving Norwich Thorpe Railway Station on Sunday May 12, 1968 when it was one of at least 10 new shiny ECOC vehicles (not one displaying any side adverts) taking passengers from the Flying Scotsman excursion on a variety of tours. As delivered, the driver access to the cab was by squeezing between the partial screen behind the driver’s seat and the offside body side. I had them rebuilt so you walked over a more substantial engine cover incorporating the ticket machine mounting. The point to comparing the two engines was a bit academic as NBC bought no more bus versions! NAH 661/2F had Bedford 330 engines and were VAM5. NAH 663/4F had Leyland 400 engines and were VAM14.